I have been researching issues related to sustainable consumption for the past two decades. This work centers on the formulation of strategies to achieve absolute reductions in end-user demand for energy and materials by calling into questions several main tenets of contemporary consumer society. My interest in this area started with a blue-skies grant from the Economic and Social Research Council in the UK while I was based at Oxford University and this project gave rise to an co-edited volume (with Joseph Murphy) entitled Exploring Sustainable Consumption: Environmental Policy and the Social Sciences. Published in 2001, this was one of the first book-length academic treatments of the subject. Upon returning to the United States, I embarked on several projects designed to culturally translate the then-emergent notion of sustainable consumption into a North American context and this prompted me to focus on nutrition, physical activity, and financial literacy. With respect to the third element of this policy package, my work on the monetary dimensions of sustainable consumption predated and prefigured the financial crisis that came to a head in 2008. These interests led to an extremely fruitful collaborative relationship with Halina Szejnwald Brown and Philip Vergragt that continues to the present day. In addition to joining forces on a 2011 edited book entitled Innovations in Sustainable Consumption: New Economics, Socio-technical Transitions, and Social Practices the three of us (along with John Stutz) are co-founders of the Sustainable Consumption Research and Action Initiative (SCORAI), an international network of researchers and policy practitioners working at the interface of material consumption, human well-being, and technological and cultural change. We also serve as co-editors of a newly launched book series on sustainable consumption published by Routledge. 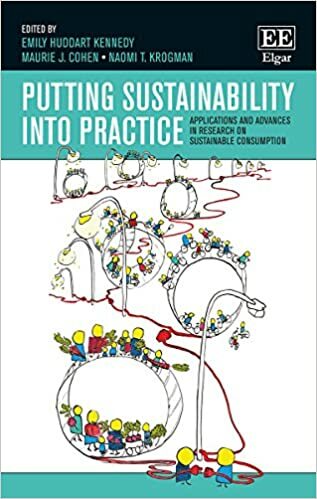 Most recently, I have collaborated with Emily Huddart Kennedy and Naomi Krogman on an edited volume entitled Putting Sustainable Consumption into Practice: Applications and Advances in Social Practice Theories. Social Change and Sustainable Consumption: Theoretical Advances and Policy Implications, London: Routledge, 2016 (co-edited with Halina Szejnwald Brown and Philip J. Vergragt (contracted and under development). Putting Sustainable Consumption into Practice: Applications and Advances in Social Practice Theories, Northampton, MA: Edward Elgar, 2015 (co-edited with Emily Huddart Kennedy and Naomi Krogman) (Download Flyer). Innovations in Sustainable Consumption: New Economics, Socio-technical Transitions, and Social Practices, Northampton, MA: Edward Elgar, 2013 (co-edited with Halina Szejnwald Brown and Philip J. Vergragt). Exploring Sustainable Consumption: Environmental Policy and the Social Sciences, New York: Elsevier, 2001 (co-edited with Joseph Murphy). Social Practice Theories and Research on Sustainable Consumption, pp. 3–21 in Emily Huddart Kennedy, Maurie J. Cohen, and Naomi Krogman, Eds., Putting Sustainable Consumption into Practice: Civic Engagement and Social Practice Theory, Northampton, MA: Edward Elgar (with Emily Huddart Kennedy and Naomi Krogman). Forging Further into Putting Sustainability into Practice, pp. 231–238 in Emily Huddart Kennedy, Maurie J. Cohen, and Naomi Krogman, Eds., Putting Sustainable Consumption into Practice: Civic Engagement and Social Practice Theory, Northampton, MA: Edward Elgar (with Naomi Krogman and Emily Huddart Kennedy). Supplementing the Conventional 3R Waste Hierarchy: Considering the Role of Carbon Rationing, pp. 214–224 in K. Ekström, Ed., Waste Management and Sustainable Consumption: Reflections on Consumer Waste, New York: Routledge. Societal Innovation in a Constrained World: Theoretical and Empirical Perspectives, pp. 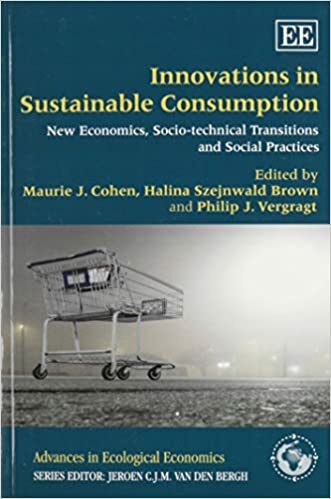 1‒27 in Maurie J. Cohen, Halina Szejnwald Brown, and Philip J. Vergragt, Eds., Innovations in Sustainable Consumption: New Economics, Socio-technical Transitions, and Social Practices, Northampton, MA: Edward Elgar (with Halina Szejnwald Brown and Philip J. Vergragt). Editorial: Sustainable Consumption and Production, Journal of Industrial Ecology 14(1):1–3 (with Arnold Tukker, Klaus Hubacek, and Oksana Mont). The Impacts of Household Consumption and Options for Change, Journal of Industrial Ecology 14(1):13–30 (with Arnold Tukker, Klaus Hubacek, and Oksana Mont). The International Political Economy of (Un)sustainable Consumption and the Global Financial Collapse, Environmental Politics 19(1):108–127. Individual Consumption and Systemic Societal Transformation: Introduction to the Special Issue, Sustainability: Science, Practice, & Policy 6(2) (with Halina Brown and Philip Vergragt). (Un)sustainable Consumption and the Political Economy of Economic Growth, pp. 174–190 in Karin Ekström and Kay Glans, Eds., Beyond the Consumption Bubble, New York: Routledge. Greening Life Cycles and Life Styles, pp. 257–274 in Arthur Mol, David Sonnenfeld, and Gert Spaargaren, Eds., The Ecological Modernization Reader: Environmental Reform in Theory and Practice, New York: Routledge, 2009 (with Gert Spaargaren). The New Politics of Consumption: Promoting Sustainability in the American Market Place, in William H. Wiist, Ed., The Bottom Line or Public Health: Tactics Corporations Use to Influence Health and Health Policy, and What We Can Do to Counter Them, New York: Oxford University Press (with Aaron Comrov, and Brian Hoffner). Money Makes the World Go Round! The Macroeconomics of (Un)sustainable Consumption, Environmental Research, Engineering, and Management, 45(3):42–53. Sustainable Consumption Research as Democratic Expertise, Journal of Consumer Policy 29(1):67–77. Consumer Credit, Household Financial Management, and Sustainable Consumption, International Journal of Consumer Studies 31(1):57–65. Oslo Declaration on Sustainable Consumption, Journal of Industrial Ecology 10(1):9–14 (with Arnold Tukker, Uchita de Zoysa, Edgar Hertwich, Patrick Hofstetter, Atsushi Inaba, and Sylvia Lorek). Sustainable Consumption American Style, pp. 123–138 in Edgar Hertwich, Tania Briceno, Patrick Hofstetter, and Atsushi Inaba, Eds., Sustainable Consumption: The Contribution of Research, Oslo: Norwegian University of Science and Technology. Sustainable Consumption and Global Citizenship, pp. 455–470 in Magnus Boström, Andreas Føllesdal, Mikael Klintman, Michele Micheletti, and Mads P. Søresen, Eds., Political Consumerism: Its Motivations, Power, and Conditions in the Nordic Countries and Elsewhere, Copenhagen: Nordic Council of Ministers. Sustainable Consumption American Style: Nutrition Education, Physical Activity, and Financial Literacy, International Journal of Sustainable Development & World Ecology 12(4): 407–418. The New Politics of Consumption: Promoting Sustainability in the American Marketplace, Sustainability: Science, Practice, & Policy 1(1):57–76 (with Aaron Comrov and Brian Hoffner). Sustainable Consumption in National Context: An Introduction to the Special Issue, Sustainability: Science, Practice, & Policy 1(1):1–7. Consumption, Environment, and Public Policy (with Joseph Murphy), pp. 3–17 in Maurie J. Cohen and Joseph Murphy, Eds., Exploring Sustainable Consumption: Environmental Policy and the Social Sciences, New York: Elsevier (with Joseph Murphy). The Emergent Environmental Policy Discourse on Sustainable Consumption, pp. 21–37 in Maurie J. Cohen and Joseph Murphy, Eds., Exploring Sustainable Consumption: Environmental Policy and the Social Sciences, New York: Elsevier. Sustainable Consumption: Environmental Policy and the Social Sciences (with Joseph Murphy), pp. 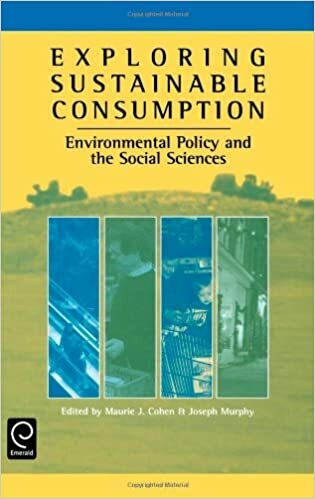 225–240 in Exploring Sustainable Consumption: Environmental Policy and the Social Sciences, Maurie J. Cohen and Joseph Murphy, Eds., New York: Elsevier (with Joseph Murphy). Harnessing Local Public Finance for Sustainability in High-consuming Countries, SSPP Blog, 27 October. How Platform Cooperativism Can Accelerate Sustainable Consumption, Shareable, 21 October. Retailers and Consumers Have Roles to Play, Princeton Packet, 26 May. Can China Build a Thrifty Society? SSPP Blog, 1 October. Building Chinese Consumer Society: Insights from American Experience, SSPP Blog, 25 June. Consuming China, SSPP Blog, 12 February. China Rising, SSPP Blog, 16 October. Sustainable Consumption and Austerity, SSPP Blog, 28 November. Getting and Spending, The International Herald Tribune, 21 January. Downshifting: Try Living on State Benefit, The Observer (London), 19 May.